I had intended to get up early and be on the ice for sunrise but things didn’t work out that way. I rolled out of bed at 8 and wasn’t stepping foot on the ice until around 9:30. By the looks of it, the morning bite was good and things had slowed up a bit since. I started off fishing with a white and orange tear drop right below the ice. Slowly working down through the water column, it didn’t take long to connect with my first crappie. While the bite didn’t slow, the quality of fish that I was on wasn’t great. 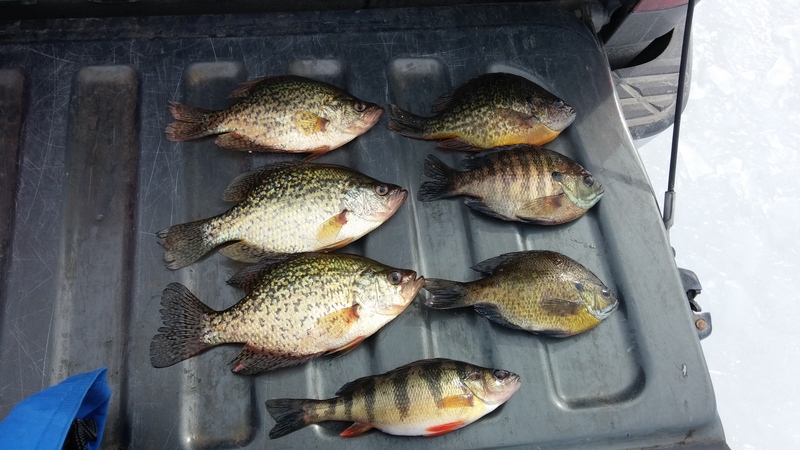 I released many crappie that were between 8 and 9 inches. After fishing from 9:30 to 4 I had caught my fair share of fish and ended up keeping a few to bring home. The bite was steady throughout the day and only the wind made the fishing difficult. I didn’t feel bad about heading out before the sun set because I knew that I would tomorrow would be another day!